Time to write about another of my collections. This time it’s miniature cottages. There are a number of firms making these nowadays, but the ones I collect are from Lilliput Lane. Apart from having a very cute name, they’re one of the longest running firms in this market. 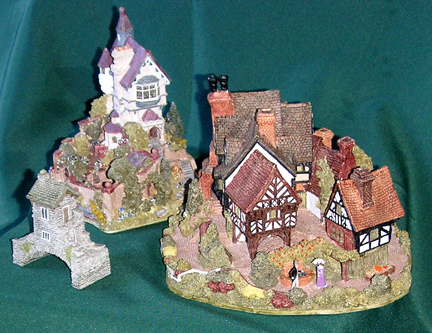 Lilliput Lane was founded in 1982 by David Tate who, with his wife Sandra, moved up to the beautiful Lake District of England, bought the picturesque little Rose Cottage (model on the right) and began designing and making these miniatures. The cottages are all authentic examples of vernacular architecture from all around the British Isles. They also have collections from other countries but the British cottages are by far the most popular. The models are cast from Amorphite, which is a compound David Tate invented, composed of finely ground gypsum with other substances added to it. I just love the exquisite detail that the modellers and painters bring to these little houses. You can display them from any angle and there’s always something interesting to see. On a trip back to England in the 90s I visited the manufacturing works where they are made. It was really interesting to see the process and the level of detail and hand work that’s involved. The original cottage where the Tates lived, now a museum for past pieces, is set in beautiful gardens. 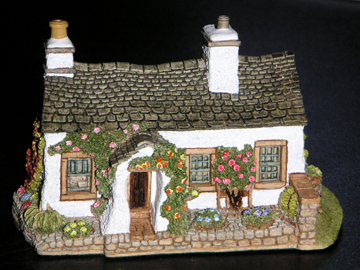 The model of Rose Cottage can only be purchased by visitors to Lilliput Lane and is not available in shops or by mail order. And in a magnificent piece of reverse engineering they have built a full size replica of one of their early cottages, Honeysuckle Cottage, nearby to house the showroom and cafe. I began collecting these models in 1988 on a trip back to the UK. I’ve bought a few in Australia but they’re really expensive here so mostly I buy some each time I return to England. They’re one of my ‘must have’ holiday souvenirs and my collection currently stands at 37. I had so much difficulty in selecting a few of the cottages from my collection for this photograph, because I just love them all and choosing was really hard. The Secret Garden (back left with the purple slate roof) is definitely one of my favourites as it was one of my original pieces from that first trip. And I love the Victorian Gothic architecture of the house as well as the intricate detail of the walled garden. The other large one on the right is called Tudor Court and is a model of a Tudor ‘shopping mall’. It’s another early one and a favourite. Many of the models are of houses that really exist, not just ‘in the style of’ designs. The tiny gray stone Bridge House is one such example. I’ve been to this little two roomed 16th century cottage in Ambleside, Cumbria. It is the tiniest of cottages, straddling the river, with one room sitting on top of the other and reached by an outside stone staircase, which must have been a nightmare to climb in the freezing blustery Northern winters. But apparently a family with 6 children once lived in it! This one is a bit extra special as it’s autographed by David Tate when he came on a visit to Australia. I want to live in one of those little houses! I’ve always thought I’d love an English Cottage-style house…they are beautiful. Thanks for sharing ! They are beautiful. And I loved learning about them. Would definitely like to see more. I so remember these houses – the lilliput lane ones in particular. I loved them so much that in my art class at school (aged 10 or 11) I tried so hard to make one for my mum’s birthdya. It was pretty cool – I had a hoop and a sportscar in it – and pretty flowers all over teh lawn. “Lilliput” lane it wasn’t – more like “Chunky” Ave!! A thing of beauty is a joy for ever. or should that be,a joy for everyone? Do you have the 1988 Christmas cottage?